SMITH, Sonia and KOCHKINA, Svetlana (2017) Library exhibit going touch: bringing the history of criminal law and Holocaust to library users through a multimedia experience. Paper presented at: IFLA WLIC 2017 – Wrocław, Poland – Libraries. Solidarity. Society. in Session 112 - Poster Sessions. 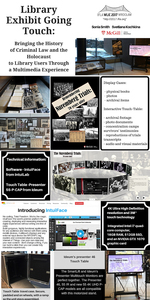 This poster will explore how the modern technology, a digital touch-table, can be used to create new learning experiences with exhibited materials for library users. Use of the touch-table allows users to interact with digital surrogates of exhibited documents in a way that is not possible with the physical objects. Moreover, it allows to show items beyond what physical space permits, featuring locally digitized items, materials from other repositories, videos, multimedia, and interactive elements. 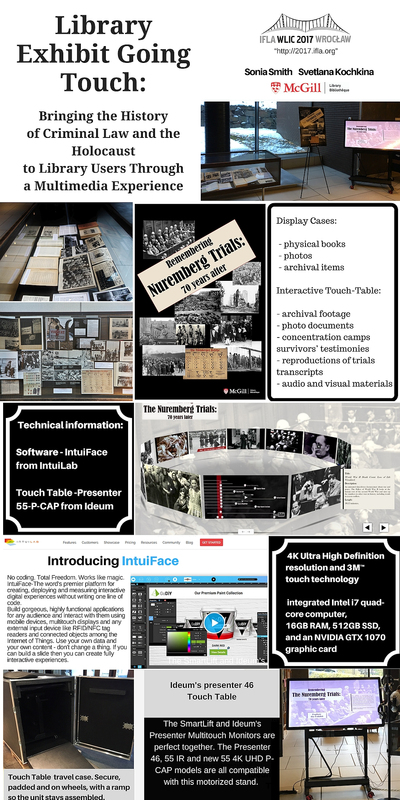 With pictures and screenshots, this poster will demonstrate on the example of the exhibition: Remembering the Nuremberg Trials: 70 Years Later, how the use of an interactive touch-table can enhance users’ engagement with the showcased materials and deepen their understanding of the presented subject. In addition to physical books, photos and archival items, this exhibition featured digital materials presented on an interactive touch-table, such as archival footage, photo documents, concentration camps survivors’ testimonies, reproductions of trials transcripts, and audio and visual materials illustrating the trial itself and the war crimes committed during the Second World War. The poster will “walk” the viewer through the necessary steps to create a successful interactive exhibit, sharing experiences and developed local practices with the software used.